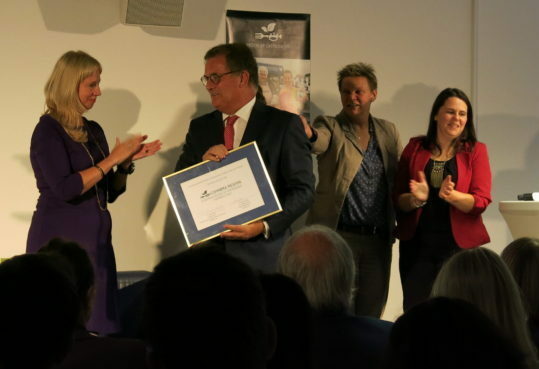 The European Regions of Gastronomy gathered once again in Brussels in the framework of the European Week of Regions and Cities to celebrate a new member of the Platform: Coimbra Region, European Region of Gastronomy awarded 2021. The ceremony took place on 8 October 2018 at the Permanent Representation of the Republic of Slovenia to the EU, where Coimbra was officially welcomed to the Platform together with Slovenia, also awarded for 2021. Based on their bid book A Million Food Stories and a jury visit during which a panel of IGCAT Experts chaired by Dr. Edith Szivas assessed the readiness of the region to hold the award, the title was officially given to Coimbra Region in the presence of Secretary of State for Spatial Planning and the Conservation of Nature (Portuguese Ministry of Environment), Dr. Célia Ramos and President of the Intermunicipal Community of Coimbra Region, João Neves. Coordinator of Coimbra, European Region of Gastronomy awarded 2021, Sandra Simões presented the region’s programme for the title year, focused on safeguarding and promoting cultural and food diversity, boosting sustainability and health through local food, supporting SMEs, enhancing the role of gastronomy in education and fostering innovation. The ceremony concluded with a tasting of local dishes from Coimbra Region and Slovenia highlighting the rich variety of landscapes and food products that both regions offer, and giving a taste of Coimbra Region’s desire to reinvent their gastronomy by innovating through local traditional flavours. IGCAT provides the Region of Gastronomy Award and is the official secretariat for the European Region of Gastronomy Platform. Furthermore, the Institute has developed the European Young Chef Award, the Local Food Gift Challenge, the Top Food Experiences of the Year and the Food Film Festivals project.